I love anything chinese and thai food and that is apparent on my blog. When people ask me what my favorite recipes are on the blog, it is definitely the better than take out chinese recipes. These are recipes that I make over and over again. And when you repeat recipes as a food blogger, you know that they are good. We recently went as a family to a fun thai restaurant. They cook the food right in front of you and it is a lot of fun! We actually went twice in a week my picky little eater loved it so much. They made a tower of onions and lit it on fire and made a volcano. My boys loved it! My little boys favorite part of the dinner were the noodles. They were so simple and the flavor was awesome. I couldn’t wait to make them for him at home. I couldn’t believe how amazing these noodles turned out. I devoured them! So simple and so flavorful! The combination of the flavors in the sauce coated the noodles and gave this dish such an awesome taste. My picky eater even gobbled them down and asked for seconds. This is such a simple meal that our family will be making again and again. We might try adding beef or chicken next time too! 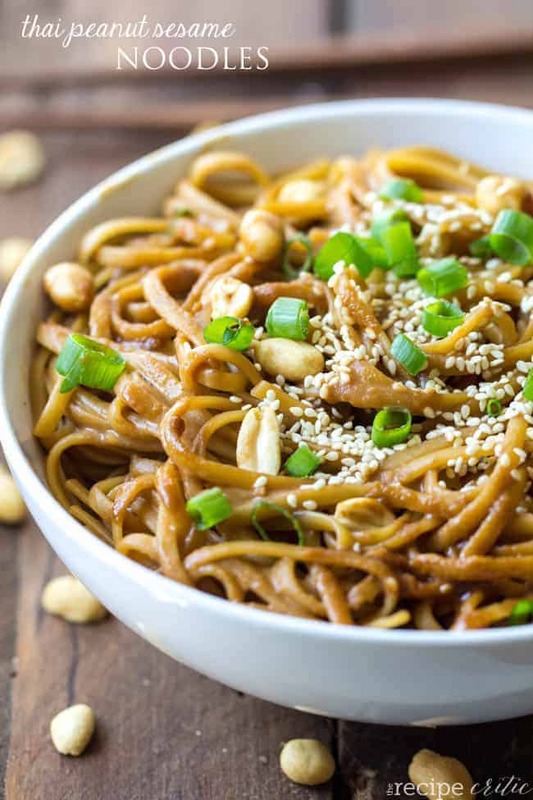 Thai peanut sesame noodles are a simple dish that has fantastic flavor and will become a family favorite! Cook the noodles in a large pot according to package directions. 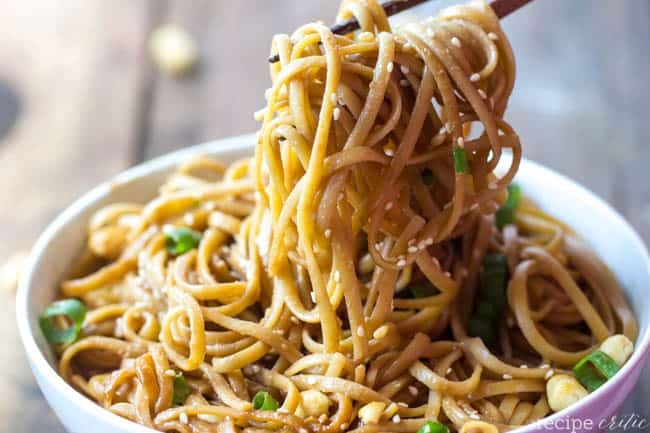 While the noodles are cooking, in a medium sauce pan whisk together peanut butter, soy sauce, sesame oil, ½ cup chicken broth, minced garlic, ginger, and sriracha chili sauce. Cook over medium heat until smooth. Remove from the heat and set aside. Drain the noodles and toss in the peanut sesame sauce. Serve immediately. Mmmm this sounds delicious. I hop I get to try it soon. Thai is one of my favorites (right after Korean) and their peanut sauces are amazing! I love the simplicity to this one and can’t wait to try it!! This sounds wonderful. Is the ginger powder or minced? Oh my gosh, seriously killing me! I haven’t had Asin food (or carbs hardly, for that matter!) in weeeeeeeeeks!! I’m dying over this. I know it’s going to be a favorite around here! I LOVE ALL NOODLS I KNOW I WILL LOVE THIS. We thought the sauce needs to be doubled. Used fresh, diced ginger instead of ground. Added the sesame oil after heating. Left out the siracha sauce for our whimpy kid, but added crushed red peppers at the table; it needed the siracha. Topped with green onions, sesame seeds, and chopped peanuts. Would be really good with shrimp or shredded chicken added to it. This was amazing! I doubled the sauce recipe and used fresh ginger, tamari (in place of regular soy sauce), and natural peanut butter. Because the natural peanut butter is unsweetened, I added about 2 tablespoons raw honey to the mix (and a little extra peanut butter… tamari is really salty!). Topped with green onion and crushed peanuts and served over flat rice noodles. Sooooo good! Yummy, Made this for dinner and everyone approved, well except for my son who said it was too spicy, so next time I will do half the sriracha. I was asked to make it again this week but to add shrimp, so I will try that and report back. I always use crunchy peanut butter. Yes, veg broth works as stock. It’s usually called broth when you buy it. I meant to rate the recipe as well. Five stars! You had me at the name! I doubled the recipe as I was feeding six. I ended up having to make another batch because everyone loved it. I used Simply Jif peanut butter, and the fresh garlic and ginger that comes in convenient squeeze tubes. I also used less garlic and ginger than called for because some of my family is sensitive to strong flavors like those. I could taste them but they weren’t overpowering. If you don’t have linguine noodles, fettucini will work fine, or even regular spaghetti. Made this tonight and it was a hit!!! I substituted vegetable broth because I’m a vegetarian and used brown rice noodles. Kids loved it- thanks!!! Hi, thanks for the great recipe! I tried it tonight and the only changes I made were using veggie broth and only a 1/2 tsp of sriracha (I’m a wimp from Minnesota). I’m sitting down to a bowl of it right now and it’s so tasty! My wife hates peanut sauce (the first time I made it she actually asked me if I was mad at her and that’s why I put peanut butter in the stir fry sauce!) , so I made it on a night when she’s gone. It only took me about 15 minutes from start to finish. Yum! This recipe became an instant favorite of mine. I, too, doubled the sauce recipe, as I like lots’o’sauce. I have been having a difficult time finding dry roasted peanuts, but I find that adding extra sesame seeds gives the noodles a nice texture. The sauce is so flavorful that I enjoy the noodles on their own, but I want to try simmering chicken in the sauce and adding it to the noodles at some point. Made this tonight exactly as written…well I didn’t have linguini so I used the buccatini I had here, but otherwise the same. Got a runny nose and felt some heat in the back of my throat from the Sriracha but it was super yummy and will definitely make it again. In fact with hubby out town for a couple days I might make it again tomorrow! Very good but WOW, too salty! Next time I’ll either do water instead of chicken broth or low sodium soy sauce. Can you substitute sweet chili sauce for the Sriracha? I used 1 tsp of Sambal Oolek instead if Sriracha and it gave a nice warm kick. I’m making this dish tonight for dinner, and I noticed, when you look at the picture it shows peanuts on top. then in the recipe it says nothing about peanuts? When do the peanuts come into the recipe. Where can I find the nutritional information for this recipe? I made this last night and it was a success! I’m not the best cook but this recipe is fool proof! If you are making it for more than one person then I would double the recipe right away. The only change I made was using udon noodles instead of the ones used in this recipe. Really yummy!! I need to make this for 14 people in take out chinese containers for an appetizer. How much sauce would I need? TIA. Great recipe. Family loved it! I did dbl the recipe and added a tsp of hoisin sauce, though. Will be making these noodles again soon. I like to add a little rice wine vinegar and a little sweetener, like honey. I plan to try this using Beyond Sausage Sweet Italian. There are a few vegans and vegetarian in my family and Beyond Sausage in marvelous so omnivores would not know it’s not meat. This peanut Thai dish has become a regular in our household! We love it!!! I couldn’t get my sauce to thicken up so I added a little cornstarch/water combo and it was perfect! We also like to add chicken and shelled edamame. Awesome recipe, thank you!! Very nice, I especially enjoyed the ginger in it. I don’t think it needs sweetened. Absolutely DELICIOUS!! And so easy. Made a fantastic hot dinner tonight and will make a great cold lunch for work tomorrow. Love it with extra sriracha sauce–the sugar in the peanut butter counters the sour in the sriracha perfectly. Thank you!! Can this be a vegan recipe with vegetable broth instead of the chicken? Will it taste the same or sort of the same? Yes, that will work. It will alter the taste a bit but it will taste great and will still be enjoyed!